Have you ever made the same experience: You are looking for a building material but you can find none of the desired quality? RIKE Audio build tube amplifiers of the top class. They lacked the appropriate capacitor. What was more natural than to build these? With us you get the capacitors from RIKE Audio, developed and produced in Germany and made of the highest quality. 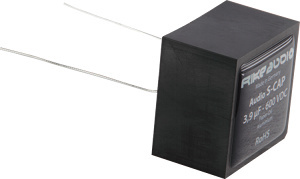 The RIKE Audio capacitor is an oil-paper capacitor with double-layered dielectric. It is designed for 630V DC and has 10% tolerance. It provides metallic electrodes of copper combined with polypropylen film as insulation. It is a non inductive construction in tubular plastic housing sealed with epoxy resin. Continuous advancement in a state of the art production and research environment ensure the constant top-level product quality. Capacitors with less than 1 uF are in cylindrical housing available; capacitors above 1 uF in rectangular housing. It is made for high quality audio devices. Enjoy amazing sound quality with the copper polypropylen capacitor RIKE Audio Q-Cap Copper PP. It is designed for 600V DC and has 5% tolerance.